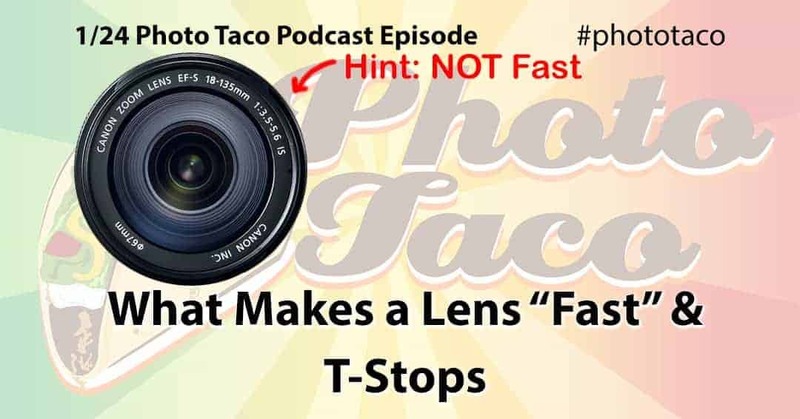 Amber Davidson: Have you ever done a podcast on lens speed? I've heard people refer to a lens as “fast” but not all same aperture lenses are considered equal. Could you explain which lenses are ideal for sports and or children due to their ability to focus faster than other vs which you could use for everyday situations? Sidney Kantor: This now has me curious…if two lenses have the same aperture but one lens is just physically bigger, would the bigger lens let in more light and therefore be faster? This sounds like a good topic for a podcast. Jeff talks about fast lenses being those with lower number maximum aperture or f-stop values because that allows the shutter speed to be higher or “fast”. He also talks about how lenses can affect autofocus speeds and that f-stops are not entirely accurate on lenses so that two of the same lenses even when the same make or model let in different amounts of light. This is why t-stop is used with lenses made for film makers and because a t-stop lens is actually measure with the amount of light let in and marked accordingly.